They're fab! Love the green and yellow combo in moss birdseye! I love Amenity! I like Number 6 in your selection. 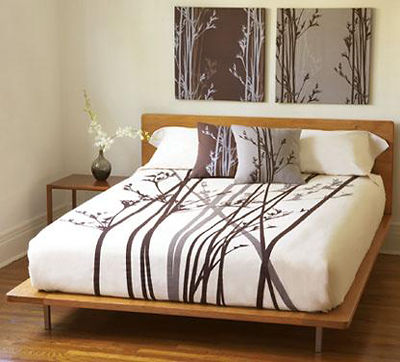 Amenity is on my list of bedroom sets to show the hubs for redoing our room! I love the blue sets they have. It's that, or take a year to quilt my own, haha! Ooh, I'm all about the Silver Trail pillows and I know exactly where they would go! So pretty! I think I like the charcoal river best. Ohh love them, so pretty! These are beautiful pillows...my favorite is Moss Trail! NUMBER SIX is my choice!! Oh, yes please! Sign me up! I love the moss birdseye ones! So very pretty! I would love to win them! I LOVE the silver trail! Moss Birdseye is beautiful. And I love how these are made from 'rescued' hardwood! I love the Moss Trail pillows. They would go perfectly in my living room! beautiful pillows. My fave is the moss trail. they are all gorgeous but i love silver trail! I love the Silver Trail pillows! so pretty. I love the Moss Trail design! These are all great! I would pick 2)Charcoal Birdseye and 6) Sienna River. The "moss trail" is my favorite pattern. And did I mention I love this blog? 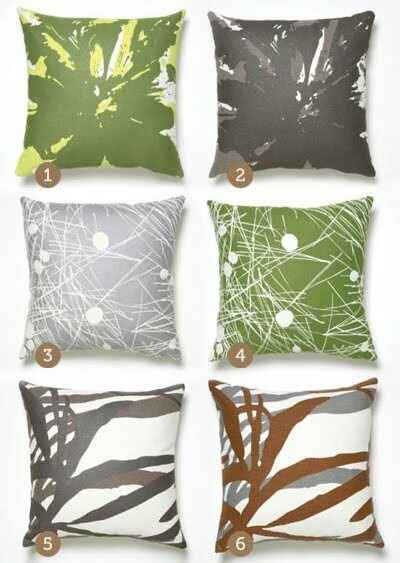 As for the pillows, I think I love the moss trail ones best, but I could easily love any of them! Love the Moss Trail - of course - it's green! My favorite is moss trail! I love the #4 colorway. So cute! Number 3 is my favoritest. I'm loving these. I'm going iwth the majority here and saying Moss Trail is my favorite too! But I do like Silver Trail as well. I would have to go with #1 or #6 - they are all awesome though! I love the charcoal river design! How fun! I'd love any of them, my favorite is probably 1 or 6. #1 or 6 - LOVE THEM ALL! I love the charcoal river. Is this open to Canadian citizens? I'd love to add #6 to my bed! I love "moss trail". They would look great in my living room. I love 3 & 4! Thanks for the giveaway! I love love love Silver Trail (3)! Beautiful room! Moss trail would look beautiful in my living room... or our master bedroom... or let's be honest, those pillows would look beautiful wherever you put them. Ah they are all beautiful, but I am partial to the Silver Trail. Moss Trail is the most beautiful. I love the "Moss Birdseye" - these designs are beautiful! They are all amazing! I am fondest of the Charcoal Birdseye most of all. Yeehaw! This is great! #4 Moss Trail is awesome! These are all gorgous! The Moss Trail are my favorite! Thanks for the information, i love it! What lovely pillows! I like the Silver Trail (#3) design. I'm moving in a few months and am looking forward to decorating my new place... These would be a great start! I like #6 - Sienna River! Very pretty! I love Silver Trail (#3)! i'm painting our living room green tomorrow....the moss trail pillows will go perfectly in the room. i would love to win. The Charcoal River is Beautiful! Love it! they are all beautiful though. What a great give away!! I love the silver trail color!! Charcoal River would go perfectly in my newly painted living room! Nice! My favorite are the Moss Trail pillows but really- they are all lovely. Oooh I like Moss trail! I've been eyeing all the bedding from Amenity for a while! The moss trail is beautiful! I love the silver trail design- so lovely! Moss trail is my favorite choice. It has a serene feel about it. I know a gal who would very much enjoy these lovelies, shhhhhh don't tell her I'm entering a chance to win them. pick me! oh please oh please oh please! i love moss trail!!!! Loove these! Charcoal River is my favorite. wow, difficult to choose, they're lovely! maybe #4 (moss trail). fingers crossed! Silver Trail - absolutely stunning. Moss birdseye would be perfect for my new room! #3 silver trail! its gorgeous! Charcoal River is my pick but they're all beautiful it made it hard to decide! I love the Charcoal River. Very nice! i love moss trail. lovely! 5) Charcoal River - love it! These are beautiful! I'd love Moss Trail pillows in my living room. Oh, wow! These are all gorgeous! I think my favorite on its own is the moss trail, but I'd have to go with silver trail to accent the rest of the room. Wow! 2) Charcoal Birdseye, I am trying to decorate our new family room and these would work so well! Hard to pick, but think I'd have to go with #6. Great colors. Oh, I love fun pillows. Totally love the silver trail! Hard choice for sure, but I like the silver trail pattern. They're all lovely, but I think I like Silver Train the best. So need pillows in our living room! I love them all! mmm which to choose!?!? moss trail maybe? I like the number 5: Charcoal River! i love the silver trail ones! Those are fantastic designs! I love #1 and #4. Love the moss trail, so pretty and fits in my bedroom perfectly. Moss Trail is oh so pretty! Moss Birdseye! Love love love these. My sofa will be dreaming of them tonight. I'm all about Silver Trail! I love the Sienna River pillow!! And then Moss/Silver trail too, ahh so hard to just pick one! These would go perfectly in my basement once we've finished renovating it! oooo, Moss Trail for me, please and thank you! I like 5 and 6, and would look oh so great with the seaglass comforter i just registered for!! I just found Amenity through Young House Love and bookmarked their bedding. I am smitten. I'd like any of those pillows! I like #2 charcoal birdseye. I love the Moss Trail pillows. Thank you so much for the giveaway! Ooh, love 'em all! Thanks for the chance to win. I really like moss trail. That would really brighten up my room! It's so hard to decide. I love the greens, but have so much green already. So, I guess I'll say the "silver trail" would look great with everything in my decor! Oh I want so much! I love silver and moss trail. Love the Moss Trail pillows. Such a great green! I love them all, but my favorite is Moss Trail- it's so natural & beautiful! The Silver Trail print is quite beautiful. It's Charcoal Birdseye for me! ohhh, love these and would definitely pick the "moss trail"
I love Charcoal Birdseye! Really, all the pillows are pretty awesome. I really love pillows...sienna river for me!!! Of course, I love your blog. Have it linked to mine. And of course, it would be very neat to get a set of these pillows. Thank you and keep posting and I will try to learn a few ideas from you.If I do win by any chance, please contact me via my blog or chimgeyoung@gmail.com thank you. Love the silver trail (3) colorway! So pretty! Thanks for hosting this giveaway! I would love the moss trail! I love the Silver Trail pillows! They would go with everything! Looks like everyone's a fan of Moss Trail - including me! Those are so gorgeous! I love all of them, haha. But Moss Trail would look the best in my room! Awesome giveaway! The "silver trail" design is my favorite. Silver Trail and Moss Trail are both gorgeous and would look fantastic on the living room couch or even on the guest bed. Thanks so much for the giveaway! Luck number four, moss trail! So gorgeous! oh pick me, I love #6!!! They are all so nice-- I like #6 the best! I want I want I want!!!!!!!! Wow, I like Moss Trail best, I think. Beautiful! My favorite is Moss Trail. I like the Charcoal River!!! Loving the moss trail. Soooo pretty. Love the Moss trail! Beautiful! Thanks for sharing! I've always wanted to do a greyscale decorating scheme, but sadly have wound up with a brown palette, and thus #6 would totally rock. I love the moss trail pattern! I just got a new bedspread and am in need of pillows. These would match perfectly. They are beautiful! I want to re do my bedroom so badly! Love the pretty greens.. very springy! Love the moss trail! I love the moss birdseye pillows! I love them all as well, especially the one on the bedspread. But I'll choose #3, Silver Trail. I really like number one, moss birdseye- I like the colours, would look great on my bed! love them all, but moss birdseye is my fav! Awesome pillows - my favorite is #5: Charcoal River. Thanks for hosting another giveaway! Absolutely beautiful! I love the Moss Birdseye!! I love Moss Trail #4 - beautiful! Ooh, moss trail is gorgeous! count me in- and thanks for the giveaway! No. 6 is my favorite! I like silver trail! great giveaway. wow! what a cool giveaway! i LOVE LOVE LOVE #3!!! thanks! Oh these are fantastic. The charcoal river would match my sofa perfectly. I'm digging #6... Fab giveaway, thanks!